It's August. Really? The summer just started and here we are on the downward slope already. Uggh! This week's color challenge sort of had me in a pickle. I couldn't come up with an idea right off the bat. I was going back and forth and that's when I noticed some die cuts on my table top that were leftover from other projects. I found the letters to make the word "HAPPY" and decided to go with the flow! I was in the mood for a little more of an abstract concept this week and decided to stamp flowers from the Beautiful Bouquet stamp set along the lower half of each of the letters in each of the colors. I adhered each of them onto a piece of Night of Navy card stock that spanned across the entire length of the card. Behind that I added slightly shorter strips of Whisper White card stock, one on top and one on bottom to help make the navy pop against the larger piece of Fresh Fig. All these pieces were then adhered on a Whisper White card stock base. And what is this card "HAPPY" about? Well about your birthday silly goose! 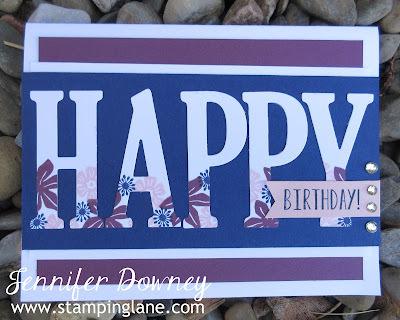 Using the birthday stamp from the Lemon Zest stamp set, I masked off part of it and stamped it onto a piece of Powder Pink card stock and created a flagged end on it. To break up all this bold and somewhat busy card, I attached rhinestones along the side for a little sparkle. Normally I do odd numbers, but that didn't seem like enough so I bumped it up to four and really liked the outcome. 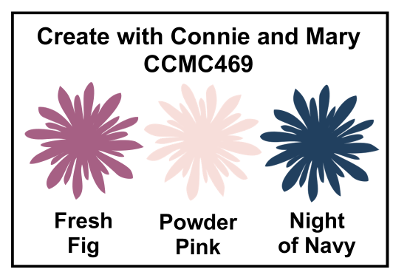 Don't forget to pop on over to Create with Connie and Mary to see everyone else's works of art with this color combination! Happy Stamping!